Jacob P. Bryniczka is principally engaged in business, estate planning and promotion and marketing law. His practice also focuses on the formation, financing, purchase and sale of businesses. 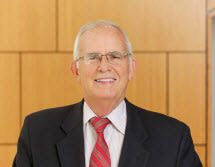 Mr. Bryniczka joined the firm in 1971. He attended Westport schools and graduated from Wesleyan University (B.A., 1967) and the University of Connecticut School of Law (J.D., 1970). He holds a Masters Degree in Taxation from the University of New Haven, where he has served as a lecturer in corporate taxation. Mr. Bryniczka has also lectured on promotion and marketing law at conferences in New York and Toronto, and is a member of the Promotion Marketing Association. Admitted to practice in Connecticut and before the United States District and Tax Courts, Mr. Bryniczka is a past president of the former Westport Bar Association (1992-93), and is currently a member of the Connecticut (Member, House of Delegates, 1985-1987) and American Bar Associations. Mr. Bryniczka has served as a member of Westport's Representative Town Meeting and the Recreation Commission.